I love Halloween and Especially love making costumes. I have always hand made all my kids costumes. They started getting older and told me I cannot dress them for Halloween anymore. They were 18 so they were right they were legally an adult so I couldnt if they didnt want :-) . That didnt stop me though I looked around and seen my Chihuahua just sitting there . I had a …ah.. ha ..moment !!!!! I went to the art supply store i bought 4 foam boards, yellow and black paint, black pleather for the seats and his cap, several different kind of materials for the passengers and the clothes he is wearing. fur material for his beard and hair. battery run lights with switch boxes for the cab light on top, the headlights and rearlights. 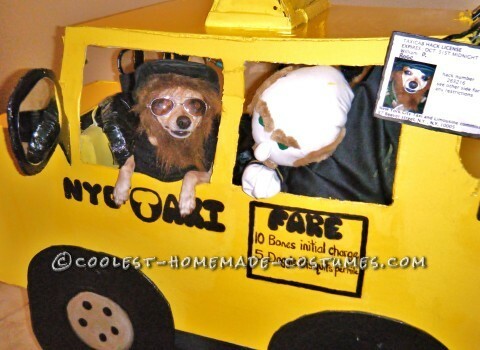 I looked up pics of NYC taxis to know how to paint it. I built it around a stroller and painted and put big wheels in front of the small wheels. So William could just sit in it and I could push it. This costume will also work for kids or adults. for someone bigger the taxi can be built around them and they walk with the taxi holding up by straps over the persons shoulders. When everyone seen it for the first time they were most amazed by the detail. The hack license, the meter, passengers , steering wheel, working lights, real mirrors, Everything you would see in a real taxi. It made it real cute how I would push the stroller and my Chihuahua would just sit there comfortable as would be a child. When I walked with it at night with all the lights on everyone was stopping me to take his photo. I love Halloween !